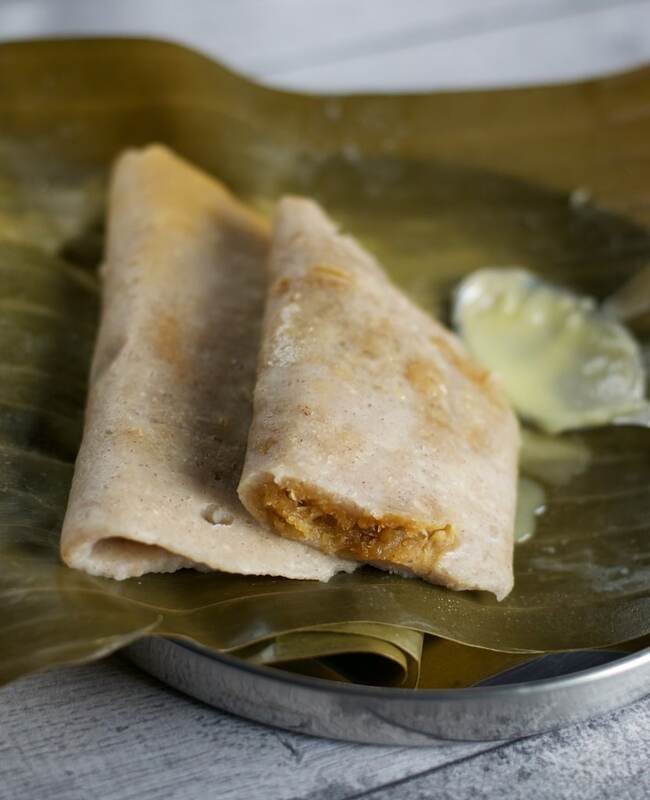 Gatti or steamed rice dumplings is a Mangalorean dish made of brown rice, jaggery, and coconut. 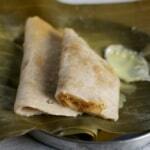 Gatti is usually made using turmeric leaves but since I could not find them, I was forced to use Banana leaves. This sweet dish is usually made during Diwali but I can pretty much eat this every single day! If there were two dishes I had to pick from Mangalore that I can’t live without they would be Kori Rutti and Gatti. It is a very simple, straightforward recipe and I don’t see anyone going wrong with this. Make sure you look at the step -by- step pictures below to get a feel for the consistency of the batter. Note: When I first posted the recipe, I had used idly rice. But I would strongly recommend using brown rice for optimal taste. Wash and wipe the banana leaves till they are dry. Cut the leaves to the desired size. Mix the coconut, jaggery and cardamom powder in a bowl till they are combined. Set them aside. Grind the rice with salt and just enough water to get a fine thick paste. Divide the paste between 4 banana leaves and use the palm of your hand or a steel bowl to spread them evenly. Add the coconut-jaggery mixture to each of the leaves and press them slightly so that it sticks to the batter. Fold the leaves into half and steam them in a steamer (see notes below on using a bamboo steamer) for 20 -25 minutes on medium heat till they are cooked. Let its rest for another 15 minutes before opening the steamer. 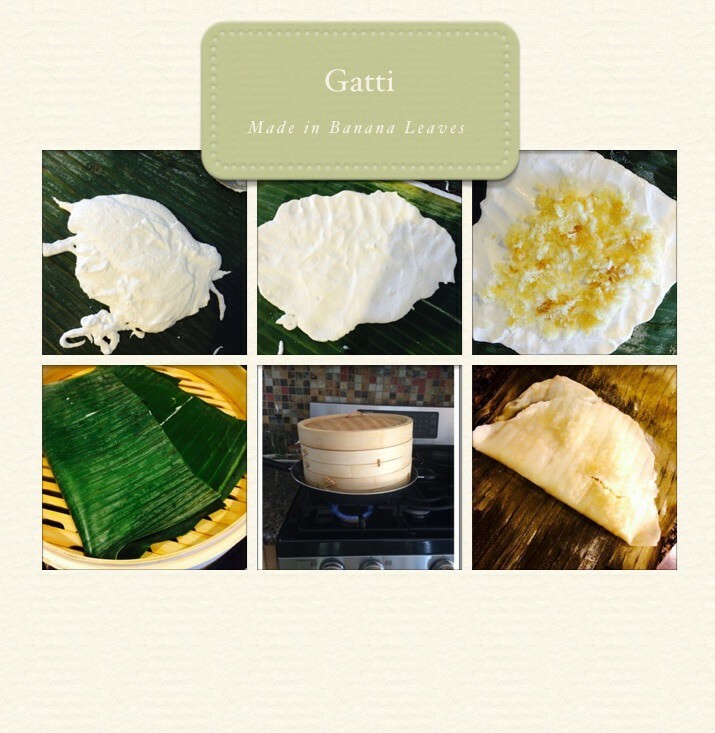 Open the banana leaves delicately to reveal the dish / Gatti. Serve hot with ghee. 1.Place food in a heat-safe bowl or plate or place directly in the bamboo steamer trays and cover with lid. If using a bowl or plate, be sure it is small enough to allow at least 1″ on the sides for steam to freely circulate. Do not let the lid touch foods. You can also use a clean muslin cloth or a kitchen towel like I did. 2. For efficient steaming; be sure lid is securely in place to prevent steam from escaping. 3. Place steamer in a large wok or pan with just enough water so that the bottom rim of the steamer tray rests in the water. Be careful not to allow water to boil up into the food when steaming. 4. Steam over medium high heat for 20 minutes. Check water level periodically during cooking and add more boiling water as necessary until food is cooked. Never let the water boil completely away. 5. When done, turn heat off. Steamer is very hot. Let it cool for at least 10 – 15 minutes. Remove lid by opening away from face. Wait a few seconds to allow steam to escape.